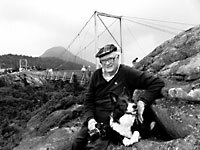 Well-known photographer, conservationist, preservationist of state landmarks, tourism promoter and public servant, Hugh Morton has been in the forefront in North Carolina for most of his life. Born in Wilmington, NC, on Feb. 19, 1921, Hugh Morton was the son of Julian and Agnes McRae Morton. In 1940, he attended the University of North Carolina at Chapel Hill. 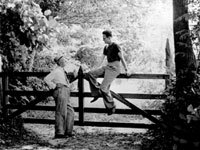 During his schooling, Hugh shot pictures for the student newspaper and his pictures were published in daily newspapers around North Carolina. 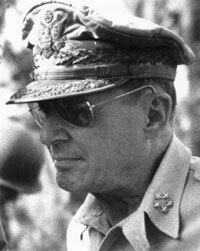 After World War II broke out, Hugh enlisted in the U.S. Army in 1942. He trained in anti-aircraft, but with his interest in photography, Hugh got assigned to the Signal Corps - as a combat photographer. He shipped out to the Pacific combat zone. Starting out as a still photographer, Morton became a film photographer during the later stages of the war. 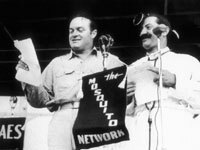 Among his world-famous pictures were Bob Hope on the Mosquito (Radio) Network and General Douglas McArthur in the Philippines. Wounded in 1945 in the Philippines, Hugh received the Bronze Star and was sent home when his father died, in order to help his mother and run the family business, the Linville Company. 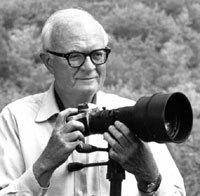 Back in the states, he married his wife Julia Taylor on December 8, 1945, and began his commercial photography career. He started the Azalea Festival in Wilmington to promote tourism. In 1952, he became owner of Grandfather Mountain and built the swinging bridge (pictured right), which greatly expanded the properties attractiveness to tourists. He headed the Carolinas Photographers Association (1949) and judged at the White House photographers contest. In promoting Grandfather Mountain, Hugh also served on a variety of state committees as a member and leader  NC Board of Conservation and Development, State Parks Committee, State (Tourism) Advertising Committee and Mineral Resources Committee (1951 - 1961). But public duty again called. 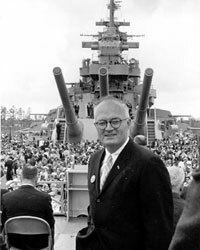 In 1961, he headed the commission to save the Battleship USS North Carolina, which led to saving the ship in a permanent park and tourism attraction in Wilmington, NC. Hugh worked with many different North Carolina Governors over the decades. And leaders often came to Grandfather Mountain from sports, media and political life. 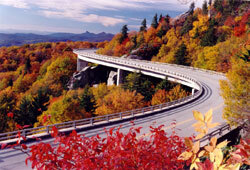 Hugh protected the mountain in a 12-year battle with the government and got the Linville Viaduct by-pass (shown below) for the Blue Ridge Parkway built around the mountain in 1966 to conserve and protect rare and endangered species found there. In 1967, he was named president of Grandfather Mountain Company, which developed Grandfather Golf and Country Club. Over the years, Morton has ceded thousands of acres of the mountain to The Nature Conservancy and the North Carolina Natural Heritage Program. And in 1992, Hugh Morton got the Grandfather Mountain named as an International Biosphere Resource by the United Nations, the only private lands at the time placed in the protected designation. He has been president or chairman of the Blue Ridge Parkway Association, Travel Council of North Carolina and the NC Botanical Garden Foundation. He served as executive producer of the PBS show, "In Search of Clean Air," narrated by Walter Cronkite. He has co-authored and authored several books, using his pictures to tell the story of the people and places in North Carolina. But saving the Cape Hatteras Lighthouse became Hugh's successful multi-decade quest. From 1981 through 1999, he was chairman of the Save Cape Hatteras Lighthouse Committee. He was honored by the U. S. Fish & Wildlife Service in 1997 for his outstanding efforts , as he has by state governors and others. Among his numerous awards are: North Carolina Award for Public Service (1983), William R. Davie Award (UNC) in 1991, North Carolinian Society (1996), Governor's Award from Leadership North Carolina (1997) and the North Carolina Business Hall of Fame (2002).